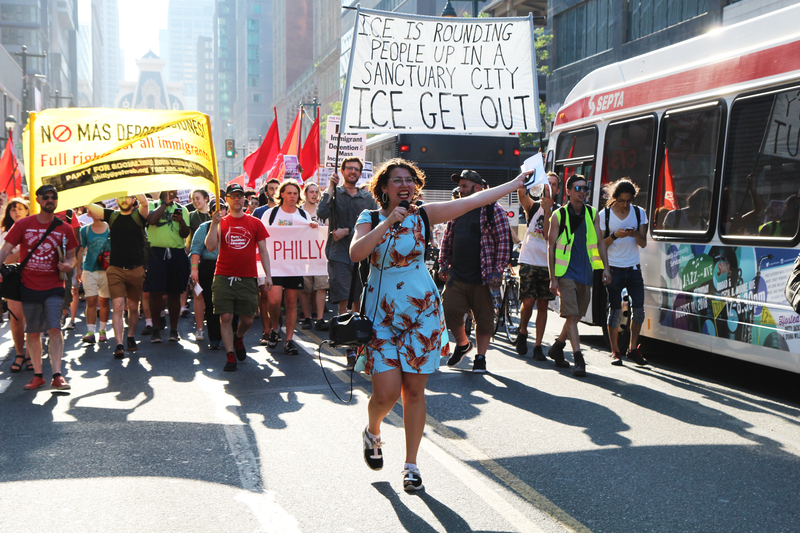 The movement to abolish Immigration and Customs Enforcement (ICE) took the City of Brotherly Love by surprise during the first week of July. Although protesters getting arrested isn’t anything new, especially in Philadelphia, there was rampant police hostility against the pro-immigrant demonstrations. That’s not a coincidence. Philadelphia’s ICE office is the most aggressive in the nation, making more “at-large” arrests of undocumented people without criminal convictions in 2017 than any other. The initial march erupted at 5 p.m. outside City Hall on July 2. There were speeches and chants at the publicly announced rally, but I arrived a half hour late. So late that once I got off the subway at the Walnut-Locust station — thinking I’d have time to stop at Wawa — I saw the protesters passing by, as the crowd wrapped around city hall. This unannounced march was a product of weeks of planning by a coalition of several organizations, but I could already tell this wasn’t an ordinary march. Everyone’s feet advanced at a pace that looked like they had somewhere to go. I soon realized the destination was 114 N. 8th Street, the address of the local ICE office. By about 6:15 p.m., the demonstration ended right where I had anticipated. Demonstrators held down and blocked off the intersection of 8th Street and Cherry Street. There were already demonstrators with banners, packs of water bottles, and snacks waiting there for the grand arrival. Activists, organizers, and everyday dissenters flocked to the doors of the ICE building to physically block anyone — particularly ICE agents with detainees — from entering. But this didn’t last long. The rest of the night, into the next day, was a constant negotiation of cops allowing — then threatening, then allowing again, then threatening again — demonstrators to stand by the federal building. Then, the following afternoon, 29 demonstrators were yanked away and arrested. “When the police moved in, we were in a line across the doors [of the ICE building] and the police were going down the line, getting people one by one,” said a Philly Socialists member who chose to remain anonymous and was also linking arms with other demonstrators when they were arrested on July 3. But despite the batch of arrests, morale was still high. The more brutality the demonstrators faced, the more support they received from the community. Philadelphians came during their commutes and lunch breaks with supplies (pizza pies, lawn chairs, beach chairs, bottles of water, and more). And the cops took notice; on a few occasions, those unloading their trunks and hatchbacks with supplies were issued tickets by PPD for idling. It was a tense environment, so tense that it’s hard to imagine sleeping while being under constant surveillance by law enforcement, so vulnerable to violence erupting at any second and being in the middle of it. On July 4 at 10:30 p.m., I was able to sink into a lawn chair and whip out my notebook. People at the encampment were meeting in a general assembly, and the camp gathered in a circle around someone with a megaphone. At the time, there were Occupy ICE camps in other major cities all over the country: New York City, Portland, Los Angeles, San Francisco, Atlanta, and even Wichita, Kansas. Many, if not all, faced some type of police repression. Earlier that night, I got the word that Atlanta’s camp was not only raided, but protesters were knocked to the ground and beaten. A moment later, a few cops approached the general assembly, probably to eavesdrop on the conversation. Then the group began chanting the demands of the occupation: Abolish ICE, shut down the Berks County Family Immigration Detention Center, and end collaboration between ICE and PPD through the data-sharing Preliminary Arraignment Reporting System (PARS) agreement. I thought about when the PPD dropped a bomb over a residential neighborhood in West Philadelphia, killing 11 people including five children, to target the Black liberation M.O.V.E. organization in 1985. Did I think a bomb would actually drop on us? No. Although it was a pro-immigration action, many protesters were white and didn’t come from immigrant families. This was partially due to the protest being risky for anyone who is (and/or has family members) at-risk of deportation — after all, it was right outside the ICE office, and even Department of Homeland Security agents showed up from time to time. But my fear was informed by a history of police violence, especially violence that targeted political dissenters. Demonstrators at the camp, especially those who slept overnight, talked about how the cops used tactics to terrorize and intimidate them. The anonymous Philly Socialists member mentioned that the cops would keep their headlights on all night to make it even more difficult for those at camp to get shut-eye. Another raid by hundreds of cops occured on July 5 around noon, just hours before a planned press conference. The camp was again demolished. This time, six people were arrested. Camps 2.0 and 3.0 — and goodbye, PARS! On July 7, the camp relocated to City Hall under new leadership. While all three demands were intended to be central to the second camp, those working on it chose to focus on the third demand: to end the city’s PARS agreement with ICE. The idea was to be physically present outside of City Hall, where the city’s leaders, including City Council members and Mayor Kenney, would see them. Within a matter of weeks, many milestones occurred. Mayor Kenney called a meeting with organizers and activists. District Attorney Larry Krasner spoke out against the PARS agreement. The city requested a meeting with ICE officials. A series of “noise demos” disrupted business-as-usual ICE operations nearly two weeks after the first camp relocated. Campers shut down city hall traffic for two hours while shouting for justice for Nia Wilson and “Free Puerto Rico!” Demonstrators (including those demanding housing for disabled people in the city) occupied City Hall. These events led to Mayor Jim Kenney announcing the end of the PARS agreement on July 27, a major victory for everyone involved with Occupy ICE PHL. The city evicted the second encampment following the ending of PARS, but a third camp was launched on July 28 across the street next to Municipal Services Plaza. Camp 3.0 added a new demand of city government — stopping racist stop-and-frisk policing. There are two demands still left to be met: shutting down the Berks Detention Center and, of course, abolishing ICE.